Two bedroom cottage with Lakeview and water access Complete use of beach 150 ' from door. Large Fireplace. Located 1.5 miles town of Winthrop on East side of Annabessacook Lake. Located on dead end street. the property is in a safe and quiet place. is close to the town near to stores and restaurant. .
Rowboat, small kayak, swimming float. Excellent hosts and comfortable and we'll equipped accommodations. Great time. Every thing we would need was provided and more. Best bang for your buck!! Paul and Betty are outstanding hosts. Cabin was clean and everything worked. Swimming dock was great. Kids loved paddleboat and kayak. The fireplace was outstanding on 2 cool nights. Would definitely stay again. Access to lake was great. Thanks again. We thoroughly enjoyed our stay. The cabin was clean, well furnished, and comfortable. We also enjoyed the peaceful, beautiful surroundings located on a private road only a mile from Highway 202 and accommodations of Winthrop: restaurants, shopping, etc. ; and quick access to Augusta. 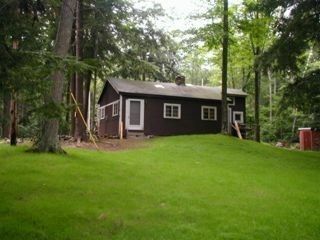 We especially enjoyed the private, peaceful setting--the cabin surrounded by woods and the lake right across the road. It was wonderful to hear the sounds of nature: bullfrogs in the lake, loons, songbirds, and a huge barred owl who lives in the nearby trees. Thank you to Paul, Betty, and their son Adam or their warm hospitality, answering questions, and addressing any needs. Thanks especially to Betty for pointing out the Jack in the Pulpits behind our cabin and telling us about Fast Eddie's Diner (great ice cream & seafood! in a cool 50's setting--complete with old-fashioned playground consisting of teeter totters, merry-go-round, etc). We look forward to returning next year. Perfect for a family looking for a simple and relaxing place where the kids and you (and Fido too!) can take the time to live "The way life should be". Our children never tire of swimming, boating, fishing, and frog hunting. The owners are very accommodating and reliable. This property has been recently renovated to include a well-built bathroom with a shower and a roomy closed- in bedroom. The kitchen is well stocked with appliances, dishware, etc. The cabin retains its old fashion charm with open wood framework and a hand-built stone center fireplace. The cabin is positioned at the end of a very quiet road into a small lakeside community. The rental comes with all the amenities that you would want in a summer place by the lake in Maine including two swimming alcoves, dock, rowboat, kayak, blueberry bushes, and great fishing! The near-by town of Winthrop offers anything you would want for food, supplies, and my favorite-- a drop-off laundry service. Our family will be there again this coming summer of 2008 and hope to continue to enjoy our vacations there for many years to come. Good swimming and fishing. Near by Museums, state parks, hiking trails and ocean.